There was some discussion as to whether it was correct for me to lace the bodice from top to bottom instead of from bottom to top (apparently the way most wenches do it). But top to bottom was the way they had it in the pattern and, anyway, I didn’t want to bother trying to re-lace it during the festival. I added a few features to the costume to help everything stay in place. I sewed two snaps at each of the shoulders to attach the bodice straps to the shirt. This kept the weight of the shawl and buckles from pulling the straps off of my shoulders, though instead it pulled on the the shirt. To keep the waistband of the skirt from slipping below the bottom of the bodice, I sewed a hook (from a hook and eye) to the inside of the bodice near each front side seam and sewed the eyes onto the waistband of the skirt. 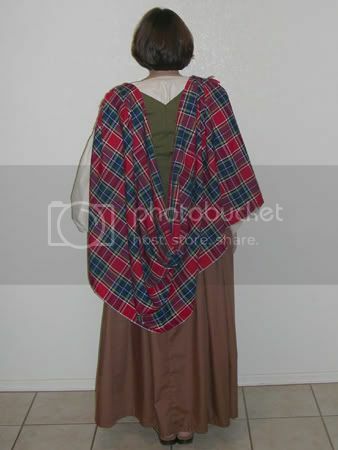 This shot of the back gives you a better view of the shawl. It was an quick and easy sew. The way I’m wearing it is not the way the pattern suggested - they wanted it to be worn longways, with a belt at the waist to keep the excess from dragging on the ground. It just didn’t look right that way, so I ended up wearing it shortways instead. 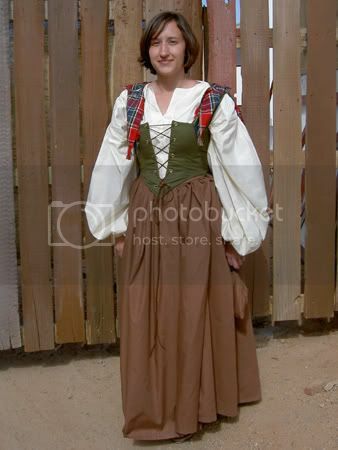 For the details on how I made each piece of this costume, see my previous posts: Skirt and Shirt and Bodice. Oooh, pretty! Your dress is very lovely. I love the colors you used. I hope mine turns out as good as yours! I like the way you hung your shawl piece. The way the pattern says to do it sounds a bit... impractical? Anyway, thanks for posting this link on my blog. It's great to see that others have made the pattern successfully!